Students and Scott Center staff during our 2017 spring break trip to Washington, DC. The Scott Center presents a series of workshops, conversations, and worship services about Christian Community in the 21st century. This event brings together two innovative Christian organizations: Music That Makes Community is a network of musicians and clergy focused on developing and renewing oral practices of singing together, and is grounded in a theology of welcome and generosity; and St. Lydia’s Dinner Church, an emergent church in Brooklyn, NY. They gather every Sunday and Monday night to cook and share a sacred meal. The congregation looks for an experience of the Holy that is strong enough to lean on, deep enough to question, and challenging enough to change us. The worship format that our leaders will present -- both deeply ancient yet refreshingly new -- is intended to complement other musical and liturgical genres rather than replace the prayer and praise that congregations already love and enjoy. Our leaders throughout the weekend will be Charlotte Moroz and Zachary Walter, from St. Lydia’s, an emergent church in Brooklyn, NY. This series is grounded in the Christian tradition, but anyone interested in the practices of hospitality and singing are more than welcome to join in, for all or just portions of the series. For more information contact Chaplain Laurie Jordan at ljordan@middlebury.edu. Sponsored by the Scott Center for Spiritual and Religious Life with generous co-sponsorship from the Vermont District of the New England Conference of the United Methodist Church. Afternoon Prayer will be the opening worship service for a series of workshops, conversations, and opportunities for reflection about Christian Community in the 21st century. 10:00-11:00 AM The Gestures of Hospitality. 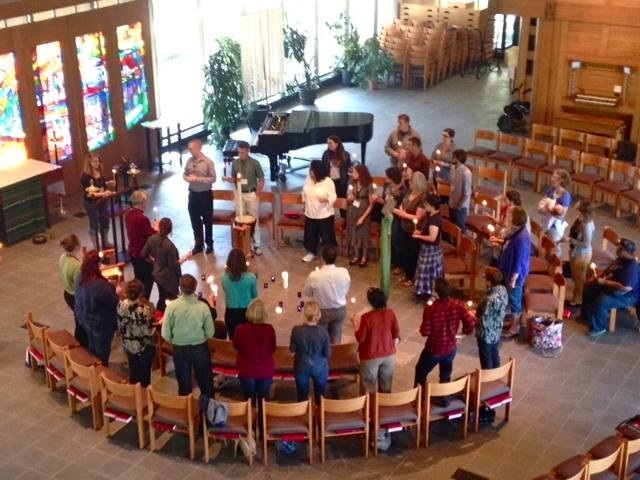 A practical workshop on how we physicalize welcoming and listening in worship and in our communities. We'll explore gestures effective in song-leading and explore the various ways gesture, posture and stance invite and welcome. A fun and practical exploration! 11:00 – 12:15 PM Paperless Music 101. How we lead and sing music together with paperless music. This workshop highlights the age-old human tradition of singing together by ear and how paperless music can enrich our services and gatherings. We’ll sing together and share leadership of paperless song! 1:30-4:00 PM Nuts and Bolts: How do we Bring Listening Home? An envisioning workshop, inviting participants to make practical plans to bring welcoming, listening and paperless music into our future services and gatherings. 4:00-5:00 PM Making our own Music: An Exploration of Musical Improvisation. A fun and elevating workshop for musicians and non-musicians alike!